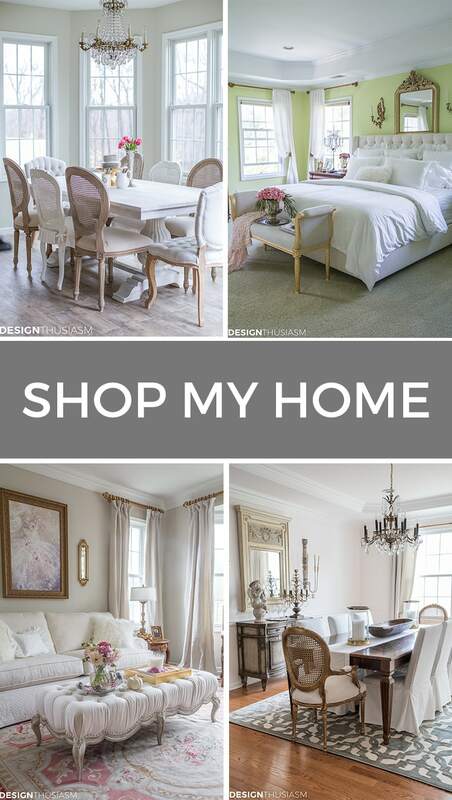 My mother used to sleep in the dining room. Well, not when she was an adult. And not in a room with a dining table. But my grandparents lived in a one bedroom apartment. When you entered their home, you walked into a room that was supposed to be a dining room. While my mother was growing up, instead, it was her bedroom. By the time she was married and raising a family, my grandparents had gotten used to having no dining room, so it became a large entry foyer and holiday dinners were served in their teeny tiny kitchen. I’m not sure I can accurately impress upon you just how tiny a room we’re talking about. Even so, it always made an impression on me that my grandmother served these meals on the finest china. No matter how small your space is, your holiday dinners can be made quite special by treating them as the exceptional events that they are. Sitting next to the kitchen appliances? No problem. 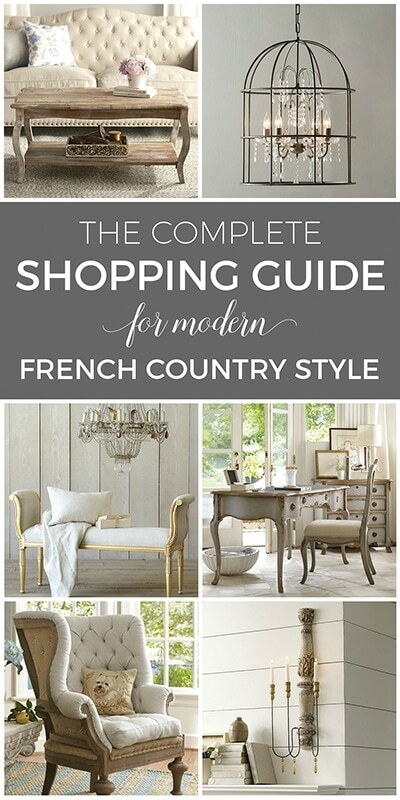 Just make sure everything coordinates and use the very best that you can afford. In our kitchen, I’ve set a lovely holiday table that plays off the sleek silver of our stainless Samsung refrigerator. 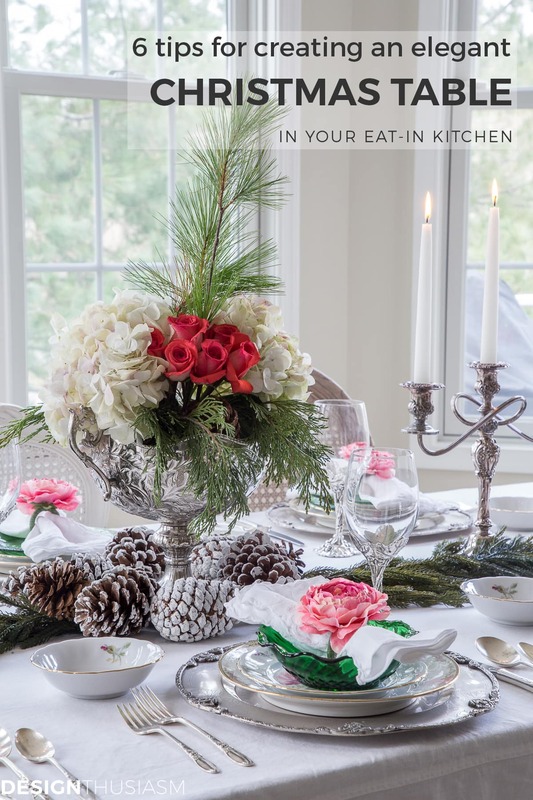 Read on for my 6 tips for styling elegant Christmas table settings in the kitchen. 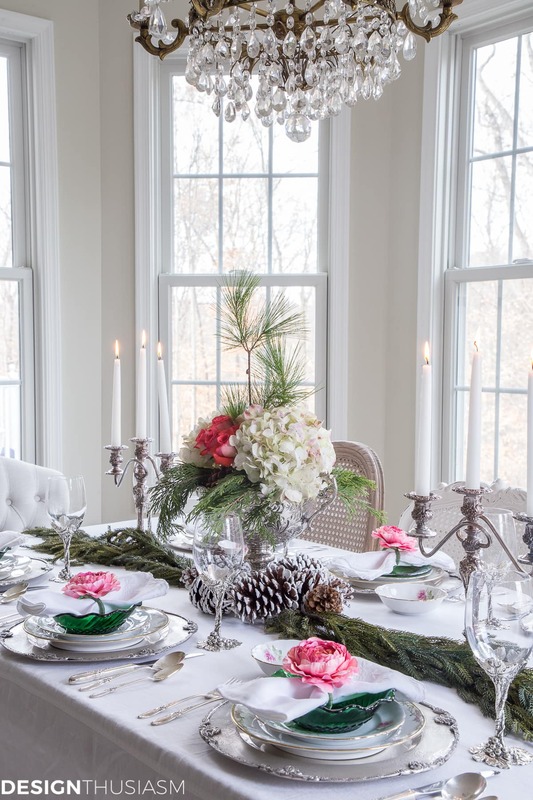 Today I’m joining with a talented group of bloggers to bring you the Styled + Set Holiday Entertaining series. Please be sure to visit all of the other posts linked at the bottom of this one. If you’re coming over from StoneGable or you’re new to my blog, let me extend a special welcome! 1. 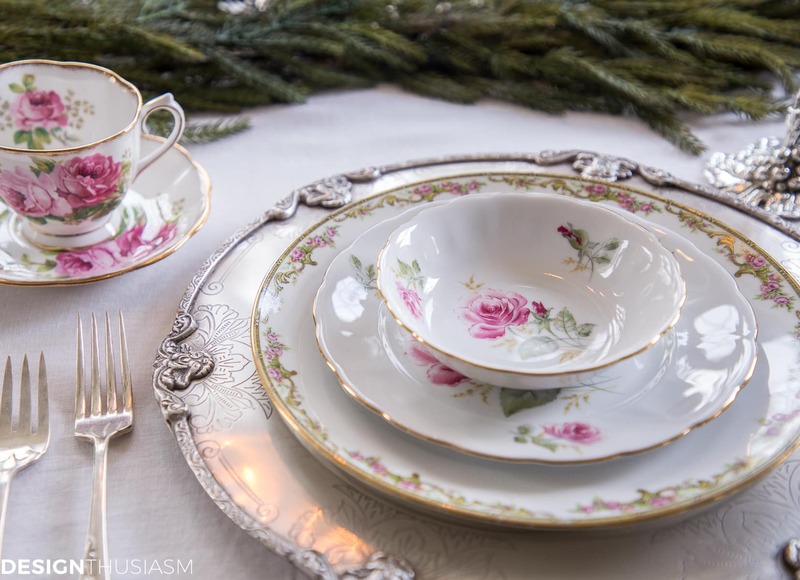 Vintage floral china – You can set a lovely table with various types of dishes, but my favorite way to impart elegance is with a mix of vintage china patterns. I love to mix and match pieces that have similar colors and the same general aesthetic, as seen on this table where I’ve used 3 different china patterns. 2. 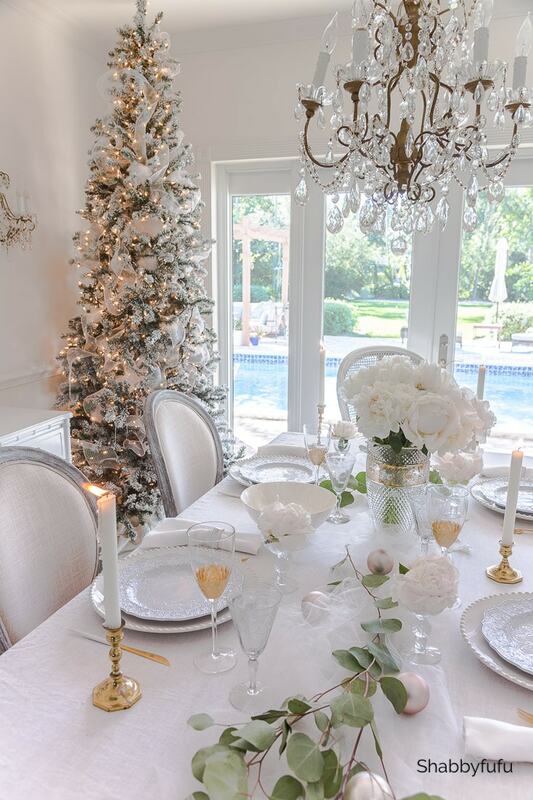 Fine white table linens – I love table runners, placemats or bare tables, but for an elegant holiday, you can’t beat the look of a white linen tablecloth and embroidered napkins. If eating in the kitchen, this styling tip will go a long way toward elevating your space to feel more refined. Add a few white linen tea towels in the cooking area to mirror the linens on the table. 3. Crystal – If you’re going for an out of the ordinary look, crystal stemware is always a plus. 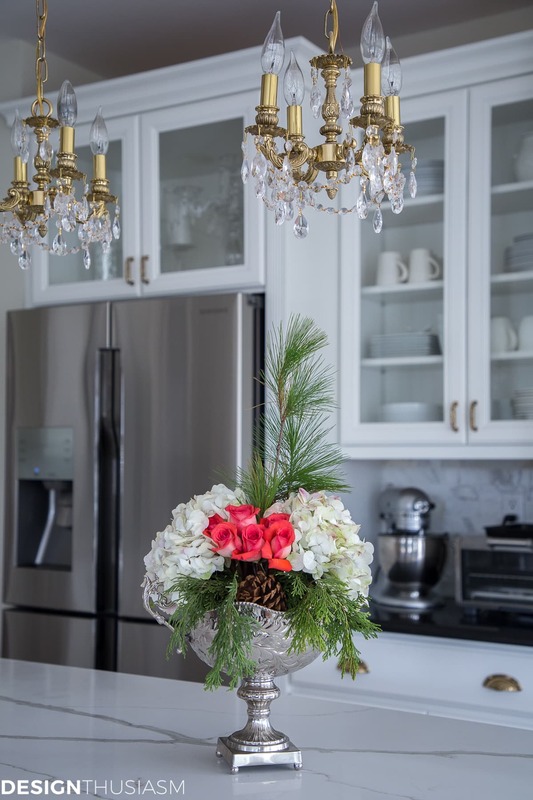 If you serve in the kitchen often, crystal chandeliers will add an upscale note, as well. 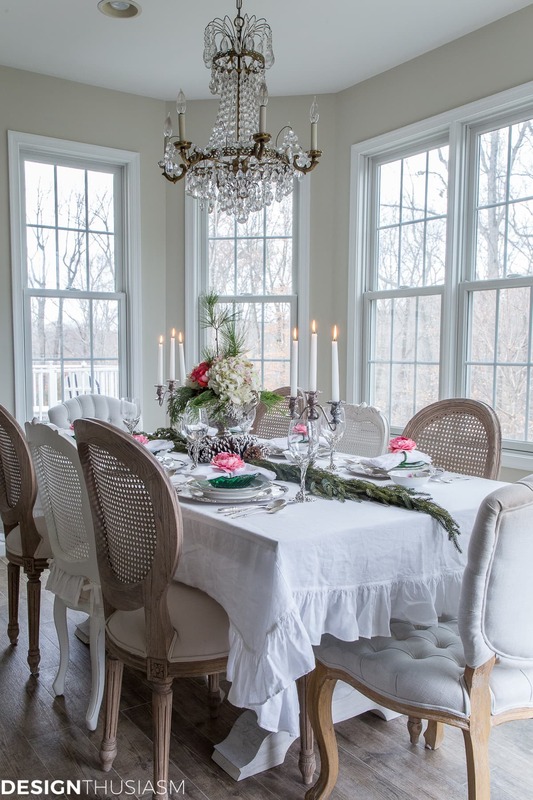 Just because it’s not the dining room, doesn’t mean it doesn’t merit crystal. 4. 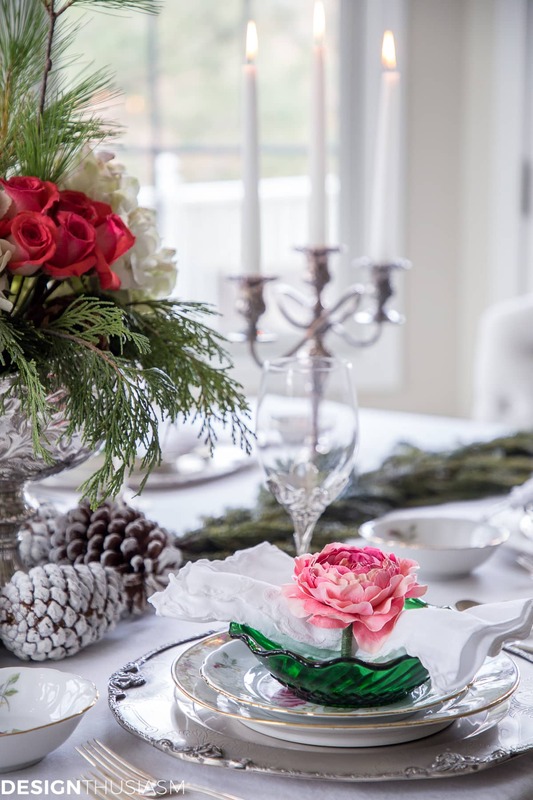 Pop of color – For a Christmas table, in addition to these first-class touches, a pop of color will keep things from getting too sedate. 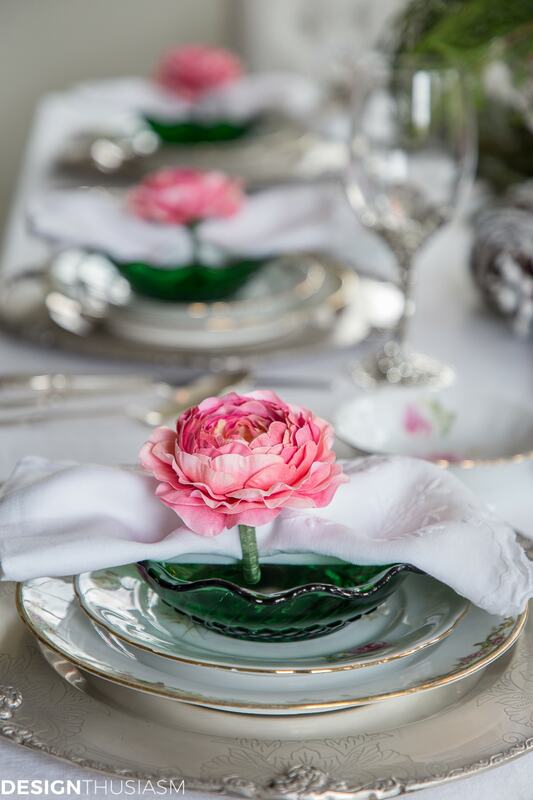 I used forest green glass bowls and rose napkin rings to add a jolt of holiday color. Garlands of greenery drape the length of the table. 5. Floral centerpiece – If there’s one element that has the biggest impact, it has to be a floral centerpiece. 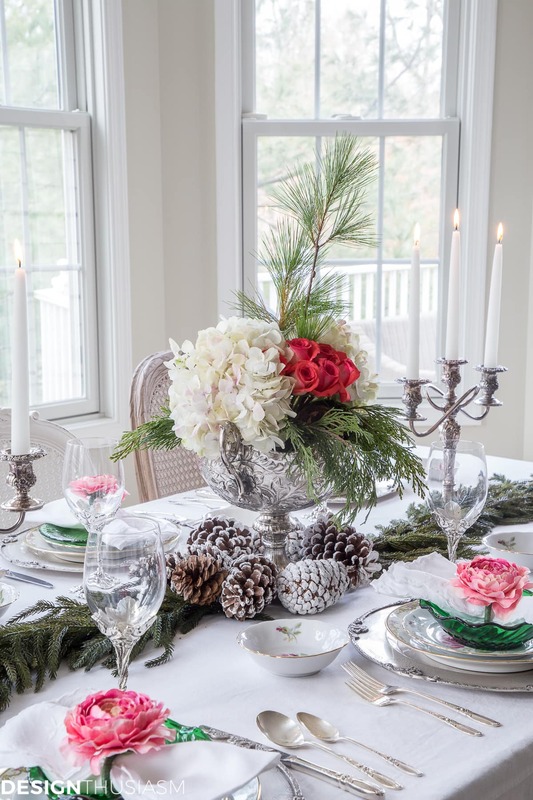 I used fresh flowers and holidays greens, with scattered pine cones for seasonal flavor. It’s hard to feel like you’re sitting in the kitchen when the table is graced with a lovely arrangement. 6. 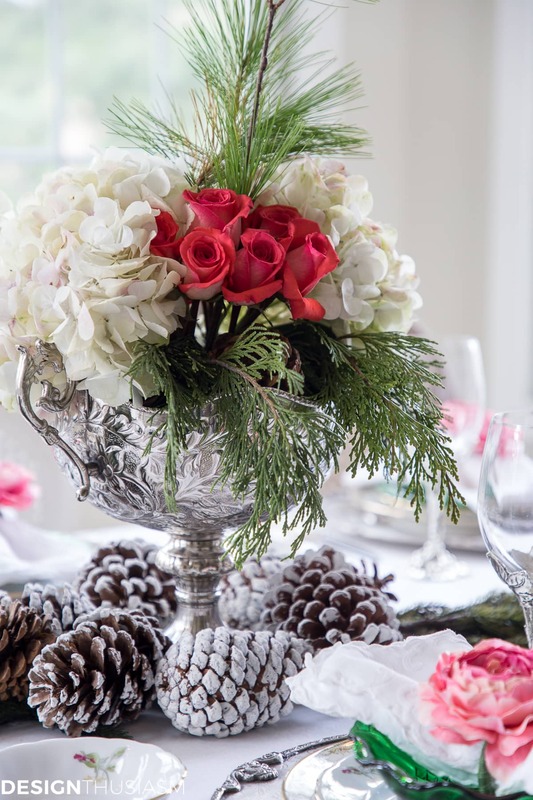 Silver – No elegant table is complete without some silver on it. 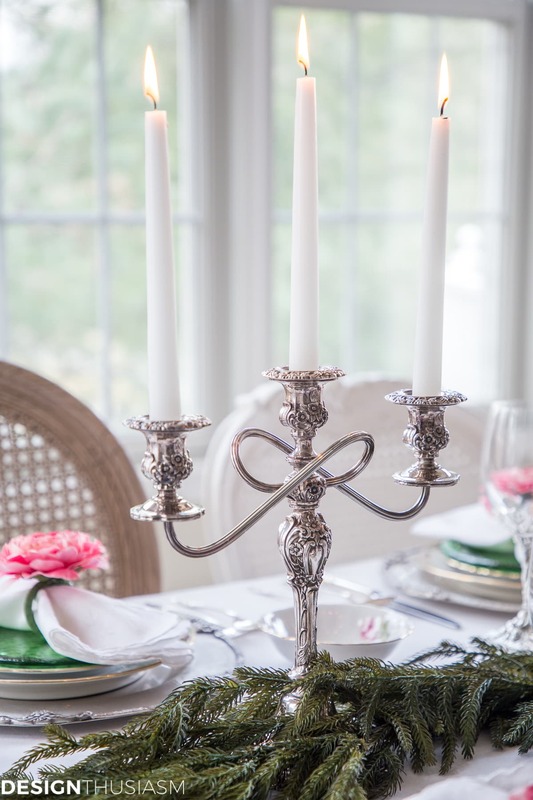 I used silver flatware, pewter chargers, silver-plate candelabras and a silver bowl for my centerpieces. But what really makes the environment special is when your kitchen is equipped with elegant elements, as well. Our appliances are silver, as is my mixing bowl and other pieces. The refrigerator is from my sponsor Samsung, and not only does it perform well, but it provides the perfect backdrop for an elegant holiday meal in the kitchen. 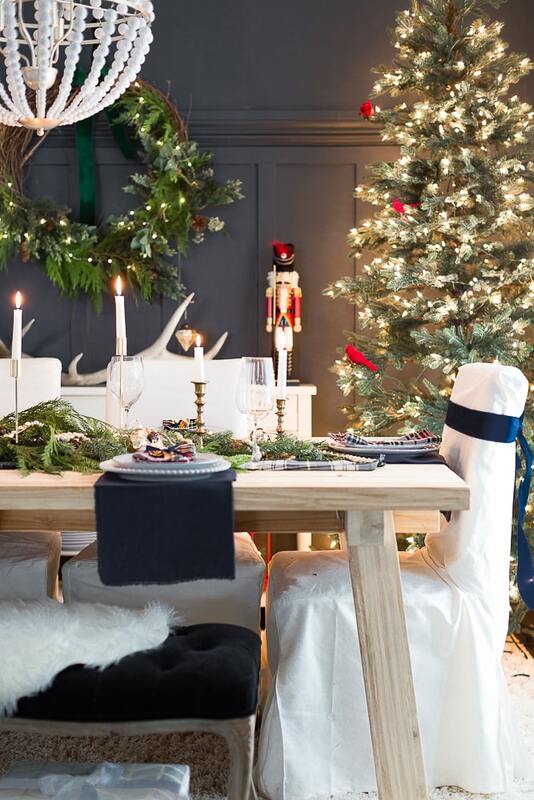 It’s sleek and stylish and adds to the exclusive nature of this festive gathering. *This post was sponsored by Samsung, but all opinions are my own and my love of this refrigerator is real. 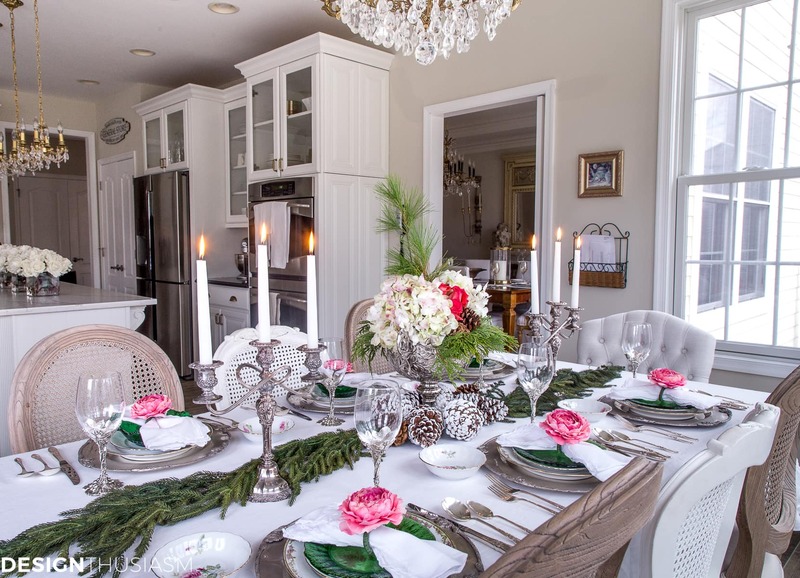 While I don’t have a tiny kitchen like my grandmother’s itsy-bitsy one, and I have a full dining room next to my kitchen, most of my holiday dinners include a large crowd and I always use the tables in both rooms. I set my tables with equal elegance and no one ever complains about eating in the kitchen. After all, the kitchen table is one step closer to the food! Next up on the tour is my friend Ann from On Sutton Place. 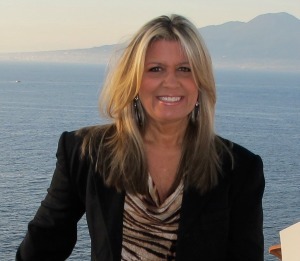 She has a wonderful way with color and I know you will love her post! Then check out the rest of the links at the bottom of this post. Christmas Table Settings resource list – To get the look, click on the items below for direct links to the products. Where actual items were no longer available, I’ve provided similar options. I just wrote a post about small dining spaces yesterday, lol. One can make any space work if you style it well…just as you’ve done here! So true, Janet! And I’ll have to look for that one… 🙂 Thanks for the kind words!! So beautiful, Lory! I loved the story of your grandma’s home. My dad’s mom served meals in her tiny kitchen too. I remember being elbow to elbow, huddled around that small table in Williams Bay, WI. I never seemed to mind though – it just felt cozy, safe, and wonderful. Thanks, Jennifer! It’s so funny that at the time it didn’t dawn on us how odd it was… lol!! Your table setting is stunning! Beyond words, really it is. Fantastic job! 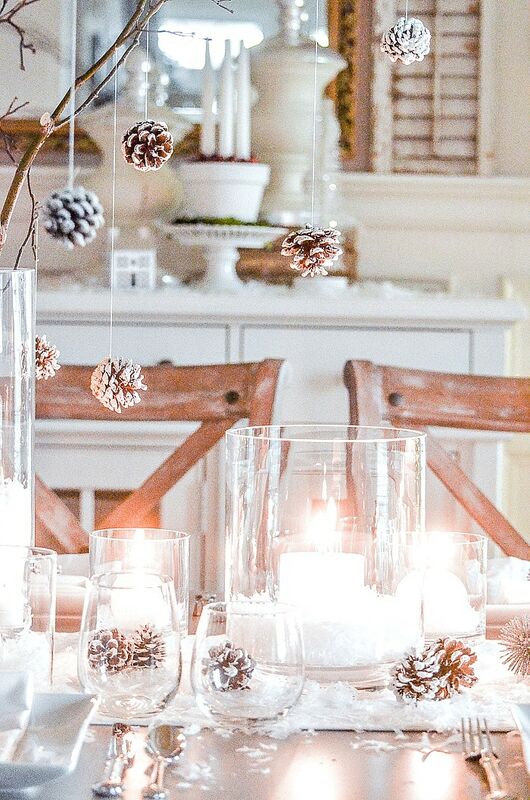 Beautiful holiday ideas for my new breakfast room! I love the contrast of the emerald dishes with the white. And I’m now on the hunt for a ruffled tablecloth! Is it sewn, upcycled or where do I find one? Thanks Lori! This is just so beautiful, Lory! I love the story about your grandparents kitchen. I’m sure it was tight but they must be ‘cozy’ memories. Where would I find the chargers? Aww, I love this story so much! And though I’m sure your kitchen is much bigger than your grandma’s was, it exudes that same homey warmth. 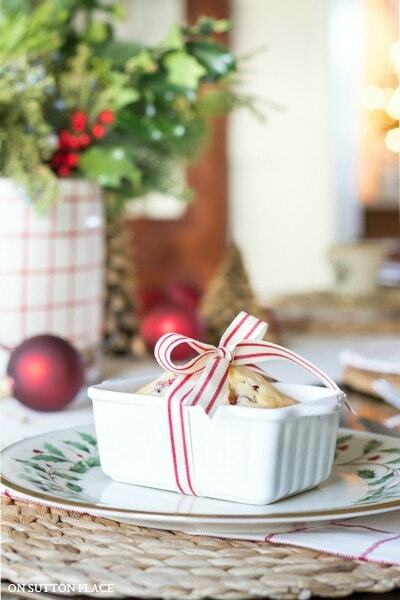 I love your pretty china and the frosted pinecones. And the jolt of pink is so pretty! Thank you so much, Sheila!! Always appreciate your kind words and having you on the tour! 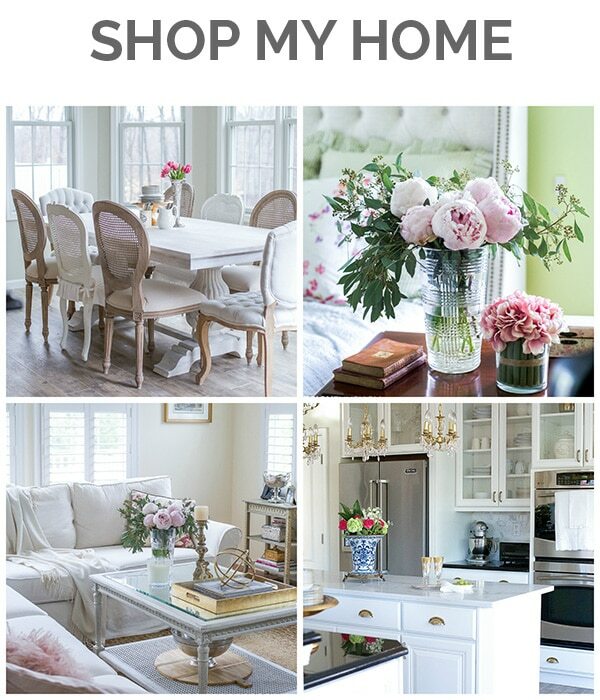 Lory, I just love your beautiful table – as always, it’s exquisite and elegant – as is your gorgeous kitchen! And your refrigerator is beautiful! We do have a small dining room, but no eat-in, or breakfast nook – we eat at our island every day! We also have limited space for entertaining in our small dining room, and I really loved all of your tips for making it as special as possible… I love touring with you my friend, thank you for having me! Thank you so much, Tamara! 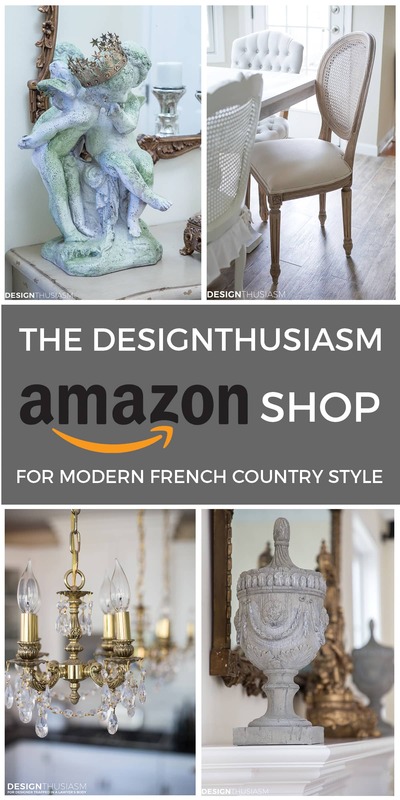 I love the updates in your dining room and it doesn’t look small at all from your gorgeous pictures…:-) So glad to have you on the tour, as always!! So gorgeous Lory! 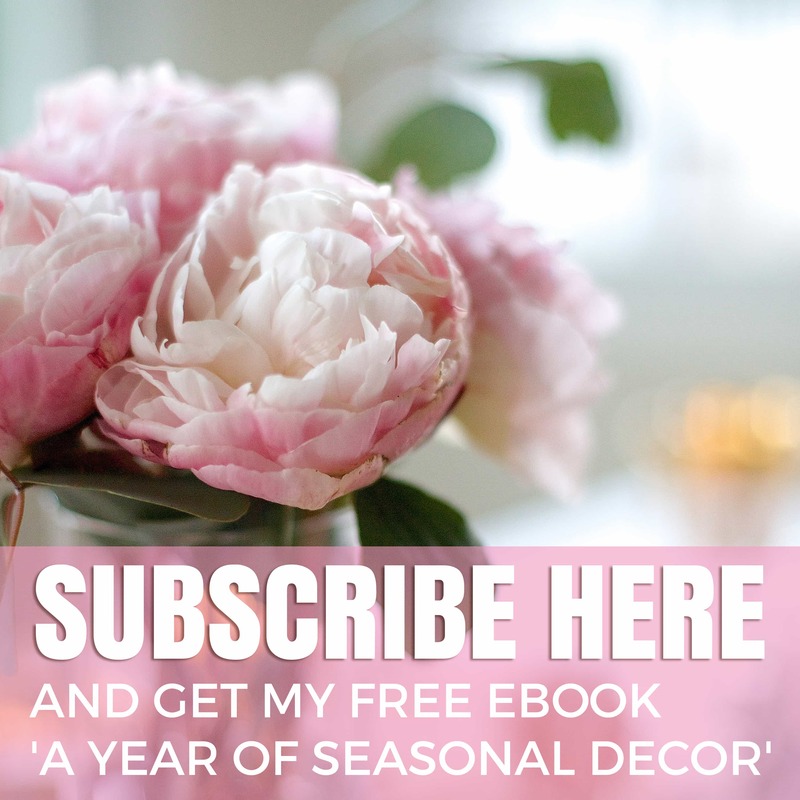 I love your florals and Christmas greenery – I bet it smells divine! 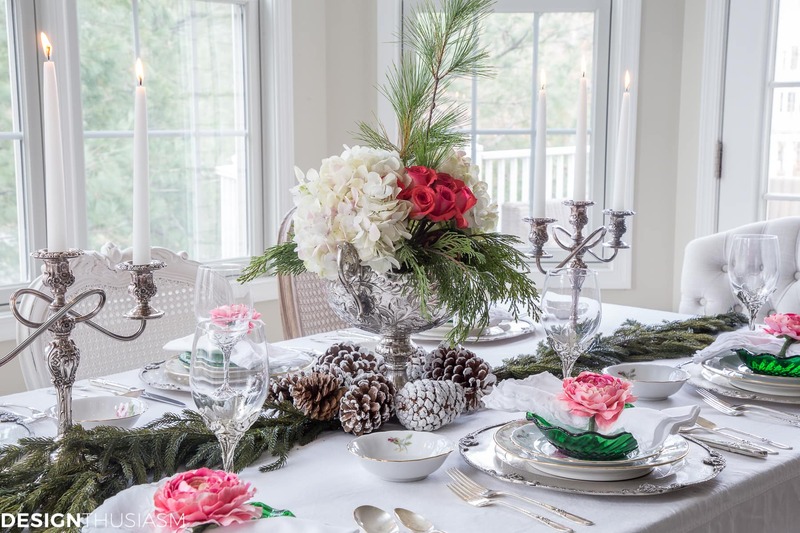 Love your stunning place settings too – you are such a creative tabletop decorator! Thank you for organizing this fun tour! Always quiet elegance at your place Lory. Just beautiful. Do you know the name of the stemware ? Last year I found a similar one in GW and searched for days, but that was it.